Norfolk Police say they have spoken to the Duke of Edinburgh after he was pictured driving without a seat belt, 48 hours after being involved in a crash near Sandringham in Norfolk. A spokeswoman said “suitable words of advice have been given to the driver”. Meanwhile, Emma Fairweather, who broke her wrist in the crash, has told the Mirror the duke has not apologised. A Palace spokesman has said contact was made with the occupants of the car to exchange “well-wishes”. The crash on the A149, in which Prince Philip’s Land Rover Freelander landed on its side after a collision with a Kia, happened on Thursday. Is age a factor behind the wheel? 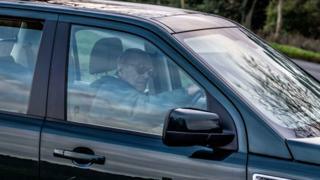 Two days later, pictures in the Daily Mail and the Sun appeared to show the duke, 97, driving alone on a road near the entrance to the Sandringham estate in a replacement Freelander, without a seat belt. A spokeswoman for the Norfolk Constabulary said the force was aware of the photographs and had spoken to the driver. “This is in line with our standard response when being made aware of such images showing this type of offence,” she said. The force said earlier it was standard policy to breath test drivers involved in collisions and both had provided negative readings. Ms Fairweather, who was a passenger in the car being driven by her friend, told the Sunday Mirror: “I’m lucky to be alive and he hasn’t even said sorry. “It has been such a traumatic and painful time and I would have expected more of the Royal Family,” she added. She said she had not heard from the royal household but had got a call from a police family liaison officer. “The message he passed on didn’t even make sense. He said, ‘The Queen and the Duke of Edinburgh would like to be remembered to you,'” she said. Buckingham Palace said on Saturday that a “full message of support was sent to both the driver and the passenger”. What is the law on seat belts? Explainer: Congress no longer runs a jail, so just how powerful are its subpoenas?